The Virtual Boy is a 32-bit table-top video game console developed and manufactured by Nintendo. Released in 1995, it was marketed as the first console capable of displaying stereoscopic 3D graphics. The player uses the console in a manner similar to a head-mounted display, placing their head against the eyepiece to see a red monochrome display. The games use a parallax effect to create the illusion of depth. Sales failed to meet targets, and by early 1996, Nintendo ceased distribution and game development, only ever releasing 22 games for the system. Development of the Virtual Boy lasted four years, and began originally under the project name of VR32. Nintendo entered a licensing agreement to utilize a 3D LED eyepiece technology originally developed by U.S.-based company Reflection Technology. It also built a factory in China to be used exclusively for Virtual Boy manufacturing. Over the course of development, the console technology was down-scaled due to high costs and potential health concerns. Furthermore, an increasing amount of company resources were being reallocated to Nintendo 64 development. Lead Nintendo game designer, Shigeru Miyamoto, had little involvement with the Virtual Boy software. The console was pushed to market in an unfinished state in 1995 to focus on Nintendo 64 development. 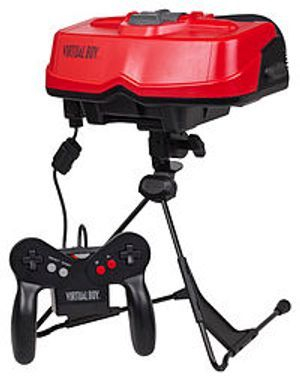 The Virtual Boy was panned by critics and was a commercial failure. Its failure has been cited as due to its high price, monochrome display, unimpressive 3D effect, lack of true portability, health concerns, and low quality games. Its negative reception was unaffected by continued price drops. 3D technology in video game consoles reemerged in later years to more success, including in Nintendo's own 3DS handheld console. The Virtual Boy is Nintendo's second lowest-selling platform after the 64DD. Since 1985, a red LED eyepiece display technology called Scanned Linear Array was developed by Massachusetts-based Reflection Technology, Inc. (RTI). The company produced a 3D stereoscopic head-tracking prototype called the Private Eye, featuring a tank game. Seeking funding and partnerships by which to develop it into a commercial technology, RTI demonstrated Private Eye to the consumer electronics market, including Mattel and Hasbro. Sega declined the technology, due to its single-color display and concerns about motion sickness. Nintendo enthusiastically received the Private Eye, as led by Gunpei Yokoi, the general manager of Nintendo's R&D1 and the inventor of the Game & Watch and Game Boy handheld consoles. He saw this as a unique technology that competitors would find difficult to emulate. Additionally, the resulting game console was intended to enhance Nintendo's reputation as an innovator and to "encourage more creativity" in games. :514 Codenaming the project "VR32", Nintendo entered into an exclusive agreement with Reflection Technology, Inc. to license the technology for its displays. While Nintendo's Research & Development 3 division (R&D3) was focused on developing the Nintendo 64, the other two engineering units were free to experiment with new product ideas. [W]e experimented with a color LCD screen, but the users did not see depth, they just saw double. Color graphics give people the impression that a game is high tech. But just because a game has a beautiful display does not mean that the game is fun to play. ... Red uses less battery and red is easier to recognize. That is why red is used for traffic lights. A number of technology demonstrations were used to show the Virtual Boy's capabilities. Driving Demo is one of the more advanced demos; its 30-second clip shows a first-person view of driving by road signs and palm trees. This demo was shown at E3 and CES in 1995. The startup screen of the Virtual Boy prototype was shown at Shoshinkai in 1994. The demo of what would have been a Star Fox game showed a Star Fox-like Arwing doing various spins and motions. Cinematic camera angles were a key element, as they were in Star Fox 2. It was shown at E3 and CES in 1995. As a result of increasing competition for internal resources alongside the flagship Nintendo 64, Virtual Boy software development proceeded without the company's full attention, and with very little involvement by lead game designer Shigeru Miyamoto. According to David Sheff's book Game Over, the increasingly reticent Yokoi never actually intended for the increasingly downscaled console to be released in its final form. However, Nintendo pushed the Virtual Boy to market so that it could focus development resources on the Nintendo 64. The New York Times previewed the Virtual Boy on November 13, 1994. The console was officially announced via press release the next day, November 14. Nintendo promised that Virtual Boy would "totally immerse players into their own private universe." Initial press releases and interviews about the system focused on its technological capabilities, avoiding discussion of the actual games that would be released. The system was formally unveiled the next day at the Shoshinkai (初心会) Show. Nintendo of America showed the Virtual Boy at the Consumer Electronics Show on January 6, 1995. Even with cost-saving measures in place, Nintendo priced the Virtual Boy at a relatively high US$179.95. :513 Though slightly less expensive and significantly less powerful than a home console, this was considerably more costly than the Game Boy handheld. With seemingly more advanced graphics than Game Boy, the Virtual Boy was not intended to replace the handheld in Nintendo's product line, as use of the Virtual Boy requires a steady surface and completely blocks the player's peripheral vision. Design News described the Virtual Boy as the logical evolution of the View-Master 3D image viewer. The Virtual Boy was released on July 21, 1995 in Japan and on August 16, 1995 in North America with the launch titles Mario's Tennis, Red Alarm, Teleroboxer, and Galactic Pinball. It was not released in PAL markets. In North America, Nintendo shipped Mario's Tennis with every Virtual Boy sold, as a pack-in game. Nintendo had initially projected sales of 3 million consoles and 14 million games. The system arrived later than other 32-bit systems from Sony, Panasonic, and Sega, but at a lower price. At the system's release, Nintendo of America projected hardware sales of 1.5 million units and software sales numbering 2.5 million by the end of the year. Nintendo had shipped 350,000 units of the Virtual Boy by December 1995, around three and a half months after its North American release. The system made number 5 on GamePro's the "Top 10 Worst Selling Consoles of All Time" list in 2007. The Virtual Boy had a short market timespan following its disappointing sales. The last official title to be released for the Virtual Boy was 3D Tetris, released on March 22, 1996. Nintendo announced additional titles for the system at the Electronic Entertainment Expo in 1996, but these games were never released. The Virtual Boy was discontinued in late 1995 in Japan and in early 1996 in North America. Nintendo discontinued the system without fanfare, avoiding an official press release. Nintendo extensively advertised the Virtual Boy, and claimed to have spent US$25 million on early promotional activities. Advertising promoted the system as a paradigm shift from past consoles; some pieces used cavemen to indicate a historical evolution, while others utilized psychedelic imagery. Nintendo targeted an older audience with advertisements for the Virtual Boy, shifting away from the traditional child-focused approach it had employed in the past. It was to be more than just another gaming console; Nintendo portrayed the system as a type of virtual reality, as its name indicates. Nintendo also focused on the technological aspects of the new console in its press releases, neglecting to detail specific games. Confronted with the challenge of showing 3-dimensional gameplay on 2-dimensional advertisements, the company partnered with Blockbuster and NBC in a coordinated effort. A $5 million campaign promoted NBC's fall lineup alongside the Virtual Boy. American viewers were encouraged via television advertisements on NBC to rent the console for US$10 at a local Blockbuster. This made it affordable for a large number of gamers to try the system, and produced 750,000 rentals. Upon returning the unit, renters received a coupon for $10 off the purchase of a Virtual Boy from any store. 3,000 Blockbuster locations were included in the promotion, which consisted of a sweepstakes with prizes including trips to see the taping of NBC shows. The popular rental system proved harmful to the Virtual Boy's long-term success, allowing gamers to see just how un-immersive the console was. By mid-1996, Blockbuster was selling its Virtual Boy units at $50 each. Taken as a whole, the marketing campaign was commonly thought of as a failure. The central processing unit is a 32-bit RISC chip, making the Virtual Boy Nintendo's first 32-bit system. The Virtual Boy system uses a pair of 1×224 linear arrays (one per eye) and rapidly scans the array across the eye's field of view using flat oscillating mirrors. These mirrors vibrate back and forth at a very high speed, thus the mechanical humming noise from inside the unit. Each Virtual Boy game cartridge has a yes/no option to automatically pause every 15–30 minutes so that the player may take a break before any injuries come to the eyes. One speaker per ear provides the player with audio. The Virtual Boy is the first video game console that was supposed to be capable of displaying stereoscopic 3D graphics, marketed as a form of virtual reality. Whereas most video games use monocular cues to achieve the illusion of three dimensions on a two-dimensional screen, the Virtual Boy creates an illusion of depth through the effect known as parallax. In a manner similar to using a head-mounted display, the user looks into an eyepiece made of neoprene on the front of the machine, and then an eyeglass-style projector allows viewing of the monochromatic (in this case, red) image. Nintendo claimed that a color display would have made the system too expensive and resulted in "jumpy" images, so the company opted for a monochrome display. The Virtual Boy was meant to be used sitting down at a table, although Nintendo said it would release a harness for players to use while standing. One of the unique features of the controller is the extendable power supply that slides onto the back. It houses the six AA batteries required to power the system. This can be substituted with a wall adapter, though a "slide-on" attachment is required for the switchout. Once the slide-on adapter is installed, a power adapter can be attached to provide constant power. The Virtual Boy, being a system with heavy emphasis on three-dimensional movement, needed a controller that could operate along a Z axis. The Virtual Boy's controller was an attempt to implement dual digital "D-pads" to control elements in the aforementioned 3D environment. The controller itself is shaped like an "M" (similar to a Nintendo 64 controller). One holds onto either side of the controller and the part that dips down in the middle contains the battery pack. In more traditional 2-dimensional games, the two directional pads are interchangeable. For others with a more 3D environment, like Red Alarm, 3D Tetris, or Teleroboxer, each pad controls a different feature. The symmetry of the controller also allows left-handed gamers to reverse the controls (similar to the Atari Lynx). During development, Nintendo promised the ability to link systems for competitive play. A Virtual Boy link cable was being worked on at Nintendo as late as the third quarter of 1996. The system's EXT (extension) port, located on the underside of the system below the controller port, was never officially supported since no "official" multiplayer games were ever published, nor was an official link cable released. Although Waterworld and Faceball were intended to use the EXT port for multiplayer play, the multiplayer features in the former were removed and the latter game was canceled. A screenshot from Mario's Tennis, the North American pack-in for Virtual Boy, on an emulator. Converted to anaglyphic red and blue format, this simulates the Virtual Boy's 3D display on a 2D display. 3d glasses red cyan.svg 3D red cyan glasses are recommended to view this image correctly. Nintendo initially showcased three games for the Virtual Boy. It planned to release three titles at launch, and two or three per month thereafter. Given the system's short lifespan, only 22 games were released. Of them, 19 games were released in the Japanese market, while 14 were released in North America. Third party support was extremely limited compared to previous Nintendo platforms. According to Gunpei Yokoi, Nintendo president Hiroshi Yamauchi had dictated that only a select few third party developers be shown the Virtual Boy hardware prior to its formal unveiling, in order to limit the risk of poor-quality software appearing on the system. When asked if Virtual Boy games were going to be available for download on the Virtual Console for the Nintendo 3DS, Nintendo of America President Reggie Fils-Aime said he could not answer, as he was unfamiliar with the platform. He noted that, given his lack of familiarity, he would be hard-pressed to make the case for inclusion of the games on the Virtual Console. The hobbyist community at Planet Virtual Boy has developed Virtual Boy software. Two previously unreleased games, Bound High and the Japanese version of Faceball (known as NikoChan Battle) were released. The Virtual Boy was overwhelmingly panned by critics and was a commercial failure. The Virtual Boy failed for a number of reasons, among them "its high price, the discomfort caused by play and what was widely judged to have been a poorly handled marketing campaign." Gamers who previewed the system at the Shoshinkai show in 1994 complained that the Mario demo was not realistic enough, was not in full color, and didn't allow for "tracking" (the movement of the image when the player turns his or her head). In the lead editorial of Electronic Gaming Monthly following the show, Ed Semrad predicted that the Virtual Boy would have poor launch sales due to the monochrome screen, lack of true portability, unimpressive lineup of games seen at the Shoshinkai show, and the price, which he argued was as low as it could get given the hardware but still too expensive for the experience the system offered. Next Generation's editors were also dubious of the Virtual Boy's prospects when they left the show, and concluded their article on the system by commenting, "But who will buy it? It's not portable, it's awkward to use, it's 100% antisocial (unlike multiplayer SNES/Genesis games), it's too expensive and - most importantly - the 'VR' (i.e. 3D effect) doesn't add to the game at all: it's just a novelty." Following its release, reviews of the Virtual Boy tended to praise its novelty, but questioned its ultimate purpose and longtime viability. The Los Angeles Times described gameplay as being "at once familiar and strange." The column praised the quality of motion and immersive graphics, but considered the hardware itself tedious to use and non-portable. A later column by the same reviewer found the system to be somewhat asocial, although it held out hope for the console's future. Reviewing the system shortly after its North American launch, Next Generation said, "Unusual and innovative, the Virtual Boy can be seen as a gamble in the same way that the Game Boy was, but it's a lot harder to see the VB succeeding to the same world-conquering extent that the Game Boy did." They elaborated that while the sharp display and unique 3D effect are impressive, aspects such as the monochrome display and potential vision damage to young gamers severely limit the system's appeal. They added that the software library was decent, but failed to capitalize on Nintendo's best-selling franchises (Zelda and Metroid games were absent, and the Mario games were not in the same style as the series's most successful installments) and lacked a system seller to compare with the Game Boy's Tetris. While Nintendo had promised a virtual reality experience, the monochrome display limits the Virtual Boy's potential for immersion. Reviewers often considered the 3-dimensional features a gimmick, added to games that were essentially 2- or even 1-dimensional. The Washington Post felt that, even when a game gives the impression of 3-dimensionality, it suffers from "hollow vector graphics." Yokoi, the system's inventor, said the system did best with action and puzzle games, although those types of games provided only minimal immersion. Multiple critics lamented the absence of head-tracking in the Virtual Boy hardware. Critics found that, as a result, players were unable to immerse themselves in the game worlds of Virtual Boy games. Instead, they interacted with the fictional worlds in the manner of any traditional 2-dimensional game (that is, via a controller). Boyer said the console "struggles to merge the two distinct media forms of home consoles and virtual reality devices." While the device employed virtual reality techniques, it did so via the traditional home console. No feedback from the body was incorporated into gameplay. According to Game Over, Nintendo laid blame for the machine's faults directly on its creator, Gunpei Yokoi. The commercial failure of the Virtual Boy was said by members of the video game press to be a contributing factor to Yokoi's withdrawal from Nintendo, although he had planned to retire years prior and finished another more successful project for the company, the Game Boy Pocket, which was released shortly before his departure. According to his Nintendo and Koto colleague Yoshihiro Taki, Yokoi had originally decided to retire at age 50 to do as he pleased but had simply delayed it. Nintendo held that Yokoi's departure was "absolutely coincidental" to the market performance of any Nintendo hardware. The New York Times maintained that Yokoi kept a close relationship with Nintendo. After leaving Nintendo, Yokoi founded his own company, Koto, and collaborated with Bandai to create the WonderSwan, a handheld system competing with the Game Boy. The commercial failure of the Virtual Boy reportedly did little to alter Nintendo's development approach and focus on innovation. While the console itself is said to have failed in many regards, its focus on peripherals and haptic technology reemerged in later years. Development of virtual reality gaming platforms has continued. Because Nintendo shipped fewer than 800,000 Virtual Boy units worldwide, it is considered a valuable collector's item. The original inventor, Reflection Technology, Inc., was reportedly financially "devastated" by the Virtual Boy's performance, with dwindling operations by 1997. With the launch of the Nintendo 3DS console in 2011, Nintendo released a handheld gaming console with autostereoscopic 3D visuals. In other words, this console produces the desired depth effects without any special glasses and is portable. In the period leading up to the release of the Nintendo 3DS, Shigeru Miyamoto discussed his view of the issues with the Virtual Boy. One was the actual use of the three-dimensional effects; while it was designed to render wireframe graphics, the effects are generally used to separate two-dimensional games into different planes separated by depth. Further, Miyamoto stated that the graphics are not as appealing, and while developing the Nintendo 64, had ruled out the use of wireframe graphics as too sparse to draw player characters. Finally, he stated that he perceived the Virtual Boy as a novelty that should not have used the Nintendo license so prominently. In a 2014 interview with IGN, Miyamoto stated that Nintendo was working on a virtual reality console based on 3DS technology. However, in February 2016, Tatsumi Kimishima stated that Nintendo was "looking into" virtual reality but also explained that it would take more time and effort for them to assess the technology, and in a February 2017 interview with Nikkei, he stated that the company is currently "studying" VR, and would add it to the Nintendo Switch once it figured out how users can play for long durations without any issues. Reggie Fils-Aimé also stated in a June 2016 interview with Bloomberg that the virtual reality market needs to become mainstream in order for Nintendo to begin major development for it. Several references to the Virtual Boy are related to the Nintendo 3DS game Tomodachi Life (Tomodachi Collection: New Life in Japan). In the Localization Trailer for the game, there is a clip of Nintendo staff (personified as in-game Miis) dancing around a Virtual Boy, exclaiming: "All Hail The Virtual Boy!". Upon buying or selling a Virtual Boy, the shopkeeper says "dig the red and black styling". A Virtual Boy can be an opponent in the minigame Tomodachi Quest. The Virtual Boy makes a cameo appearance in the GameCube game, Super Smash Bros. Melee as one of the many Nintendo systems that can be seen on the shelves in the Trophy Collection if the game's language is set to Japanese. In Super Smash Bros. Brawl, all of the games that were manufactured for the Virtual Boy in North America appear in the form of a list within the chronicle section.